Sinigang is a Filipino staple that offers comfort to the soul, in the form of savory and sour tamarind flavored soup. The interesting thing about Sinigang is that I actually never used to like it when I made it with it’s traditional ingredient, pork. Sour soups just weren’t my thing back then, but now, I believe my taste buds have evolved and changed for the Vegan palate. I soon found myself wanting the broth to be more sour once I made it vegetable based. Crazy as it sounds, I’m so glad my taste buds have evolved because I’ve grown to love this dish so much. With every broth that uses a rich meat stock as it’s foundation, we can always use the power of dried shiitake mushrooms to give us that richness in the Vegan world. It’s actually quite amazing. The more dried shiitakes you pack into the broth, the more bold it becomes. I also believe Kombu to be an essential part of giving broth umami. For this recipe I wanted to add in a little something to make it even more special, so I grabbed some dried porcini mushrooms that I usually use to make vegan gravy, and this brought the Sinigang to the next level. You’ll want to prepare all the aromatics to include, onions, leeks, garlic, a banana pepper, and some ginger. Once those are ready to go, toss them into a pot with about two tablespoons of coconut oil for browning everything. In the meantime, prepare your tomatoes by simply cutting them in half. I usually use about 5-6 Roma tomatoes for this recipe. Once all your aromatics are slightly charred in your stock pot, you’ll want to add in a ton of dried shiitake with the porcini mushrooms and mix around. Let the fragrances light up your kitchen. It’s going to smell amazing. Once that’s all stirred, fill the stockpot with about 16 cups of water, add the dried Kombu, your tomatoes to the pot, and bring to a rapid boil. I will always reduce the pot to a low simmer with the lid half over the pot. Let that go for about 45 minutes to 1 hour. Once that’s been simmering, you’ll notice a rich golden brown broth that should taste really good as is! What we’ll do now, is add in our salt and tamarind. For that, I like to lean on Mama Sita’s seasoning packets. You’ll notice this seasoning package has shrimp on it but rest assure, it is Vegan. I will typically add 1 and 1/2 packs to the broth, but if you like it more tangy, then you can use the full two packages for about 16 cups of water. At this stage, I will also add about 2 tbsp of toasted rice powder. I’m not sure how traditional it is to use this, but I remember watching an OG on Youtube, cooking Sinigang in the Philippines, and he used rice water as his water for the broth. I figured that toasted rice powder will do the job just fine. Next up, VEGGIES! You can literally add anything you’d like. For my version, I use some fresh Bok Choy, string beans, cabbage, and corn. I’l also throw in fresh shiitake mushrooms or even brown mushrooms because, well…you can never have enough mushrooms. Let all the veggies simmer for another 20 minutes and everything should be fork tender. This is about the time when you’re ready to serve. My Filipino girlfriend likes to eat this with a touch of soy sauce over rice and a banana on the side, but you can enjoy this soup with anything! I’ve actually added some bean thread noodles to the left over broth for lunch one day and enjoyed it as a soup noodle dish too. Amazing, but not very traditional. That’s it! You’re ready to grub down and enjoy a hearty Vegan Sinigang. The broth is rich, the flavors run deep, and that sour tamarind just smacks you in the face! Please feel free to leave comments below. Let me know if this was a recipe you enjoyed and if you cook it, don’t forget to get that on your IG and tag me @goodlifecookin so I can check out your version! 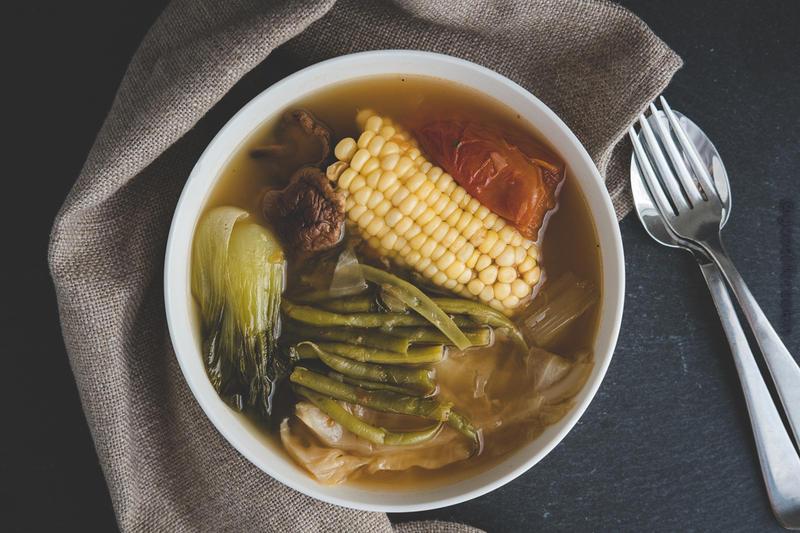 A traditional Filipino soup packed with tamarind flavors and great veggies! Prepare and rinse all vegetables. Slice onion in half, and slice leeks into quarter sized pieces. Peel skin off a thumb sized knob of ginger as well as remove skin from 4 cloves of garlic. Cut 1/2 cabbage into quarters. Slice all tomatoes in half. Rinse and drain bok choy and set aside for later. In a stock pot, heat up 2 tbsp of coconut oil and char the onions and leeks with 1 tsp of salt. When golden brown, add the dried shiitake and dried porcini mushrooms. Stir pot and cook for about 2 minutes to bring out the dried mushroom flavors. Fill stock pot with water and bring to a boil. Once boiling add tomatoes, banana pepper, and reduce flame to a low simmer. Set lid halfway over the top and simmer for 1 hour. After 1 hour, add in 1.5 packs of Mama Sita Sinigang Seasoning. Stir in 2 tbsp of toasted rice powder. Add all vegetables, corn, and fresh shiitake mushrooms and let simmer for another 20 minutes with lid on. Serve with fresh steamed rice with a touch of soy sauce and slices of banana on the side.